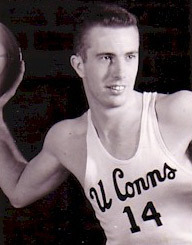 Peter Lind was a Center for the UConn Huskies from 1948 – 1950. 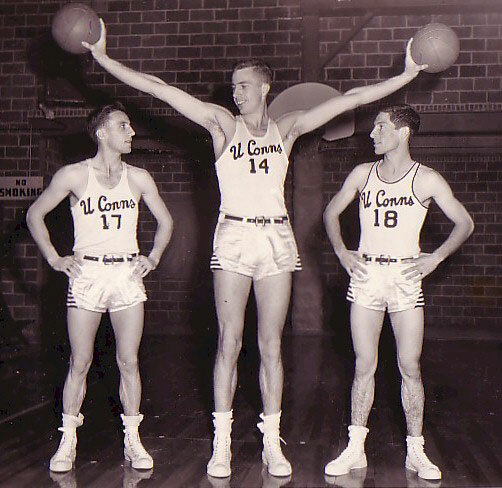 He’s a member of the UConn Basketball All Century Ballot, was an All-Yankee Conference First Team selection in 1949 – 1950, and was the top rebounder that year. Pete was also top scorer in his junior year, and co-captain of the team his senior year. I met with Pete in August 2005, as he reflected on his collegiate, and post-collegiate days, his career, and his outside interests. Pete grew up in Long Island, New York, and started playing basketball around the time of the Japanese attack on Pearl Harbor in 1941, in the backyard. During high school, sports were curtailed because it was during World War II. There were cutbacks, and gas rationing, so the teams weren’t able to travel much. The focus was more on the world than on high school sports. When Pete was a senior in high school, and could touch the ceiling when no one else could, is when he knew basketball was going to be in his future. Upon graduation form Greenport High School in 1945, he had some inquiries from several professional teams but Pete didn’t think he was that great of a basketball player, and never followed up on the inquiries. Instead, went to college at Columbia University for two semesters, and then left school to fight in World War II, as a Merchant Marine, for the next three years. “When the war was over there were so many veterans coming back, I couldn’t get back into Columbia right away.” The state of New York established two or three junior colleges, so I went to one up in Plattsburgh, New York, and played basketball there for two years.” The junior college team played the University of CT. UConn’s Head Coach, Hugh Greer, must have liked what he saw in Pete because soon he offered Pete a two-year scholarship to transfer to UConn. Pete graduated from UConn in 1950 with a Bachelor’s Degree in Business Industrial Management. He continued to play recreational basketball back in New York. In 1953 Pete began his professional career at Aetna Insurance Company in Hartford, CT. He worked in different areas of the company in the Casualty and Surety Division. He started out completing yacht surveys (he had an interest in boats, his fathers business was a shipyard in Brooklyn, New York). Throughout his career at Aetna, Pete worked in Connecticut, Illinois, Rhode Island and New York, as he became a General Manager of Aetna’s Syracuse Branch Office, and then he became an Assistant Vice President in CT, and ultimately Vice President. 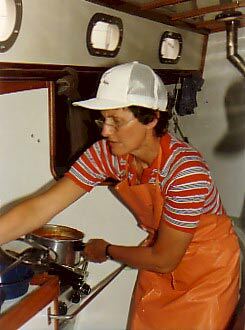 After 35 years of service, Peter retired early from Aetna in 1987 to enjoy his outside interest, sailing. 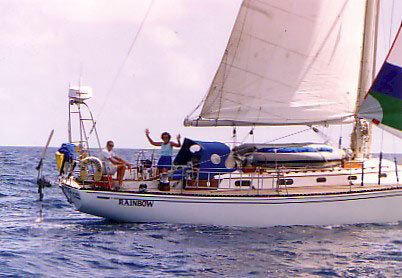 Pete and his wife, Carolyn, had a sailboat built, and set sail living on the boat for the next six years as they sailed around the world sightseeing. They went from Bermuda to the Azores, to Portugal into the Mediterranean, on to Turkey, down the Red Sea to Kenya, across the Indian Ocean to Malaysia, Indonesia, Morocco, Singapore, Borneo, the Philippines, Hong Kong, Japan to Vancouver, up to Alaska, down the West coast of the U.S., and up the East coast, back to Stonington, CT.
Peter met Carolyn, his wife of 55 years, while at UConn. Carolyn knew UConn Head Coach Hugh Greer from his previous coaching job at South Windsor High School in CT where she went to school. She told Coach Greer she was going to college at UConn to meet Pete Lind, and she did. After Pete graduated from UConn, he and Carolyn got married. Pete started his professional career in Rhode Island so they relocated. Not having graduated yet, Carolyn transferred her credits to Barrington College in Rhode Island where she received a Bachelors Degree in teaching, and spent most of her teaching career at Renbrook School in West Hartford, CT.
Peter and Carolyn have four children- Claire, Joanne, Susan, and Bill. All are college graduates, but not from UConn. Two daughters work at ING Financial Services in Hartford, CT, and one daughter works for the CT Judicial System, and is a victim’s advocate. Bill, who shares the sailing interest with his father, is a Vice President of The American Bureau of Shipping in Houston, Texas. Bill is a boat designer who designed the sailboat Pete and Carolyn had built for their trip around the world. Pete and Carolyn also have four grandchildren, two in Texas, and two in CT. One of them graduated from UConn, and is currently in a Ph.D program at UConn.